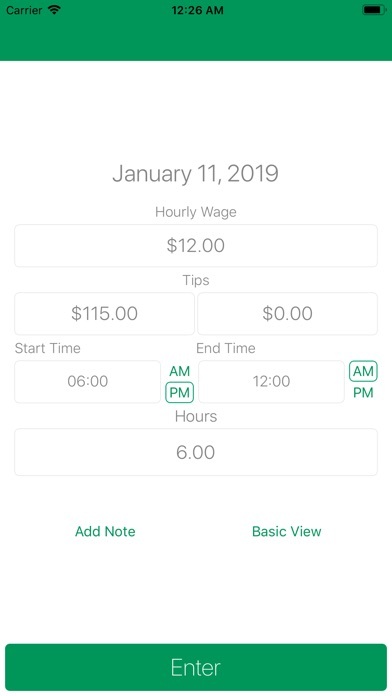 Track your hourly income, hours worked, and tips with Tip Tracker. Here are some great features that Tip Tracker offers: • Track multiple jobs. • Graphs that allow you to visualize your income by year, month, or week. 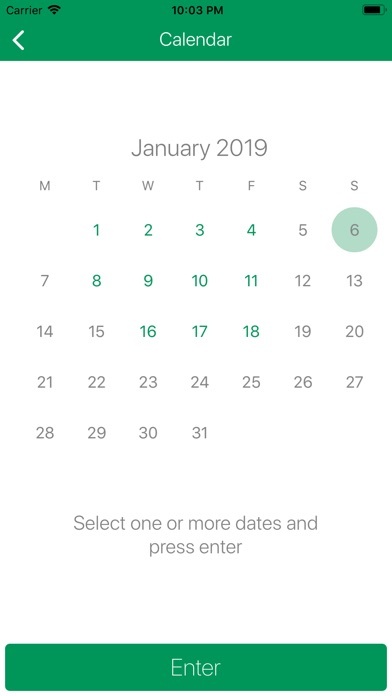 • Select your dates quickly with our built-in calendar. • Find out which days earn you the most money. All the data stored using Tip Tracker is kept on your phone and is only accessible to you. Nothing is stored online, so you don’t have to worry about your privacy. So far I really like the app, just wish there was a way to account for tipout as well! Other than that, I’ve found it to be a very useful tool. I used this app in 2018 specifically to keep track of tips so that I knew what to report on my taxes. However, once we were into 2019, there was no way for me to go back and get the 2018 data. When I selected the app, it was because I could supposedly view the data “by year”. However, that is totally incorrect. You can view all the data in the CURRENT year. Tracking “by year” implies that you can track data over multiple years. Trying to pull the data to do my taxes yesterday, I discovered that there’s no way to go back to 2018. I cannot view it at all - it is totally gone. All my time spent carefully tracking my tips was a complete waste. If there is a way to view the previous year’s data, it isn’t obvious. I can’t even get to settings without approving an in-app purchase, so I don’t even know what settings I can change. I’m not paying for something unless I know it’s going to resolve my problem. I’m so disappointed that my time and effort was wasted on this. If I ever end up working another job that includes tips, I’ll just keep a ledger. It’s low-tech, but at least I know I won’t be disappointed. I paid 3 dollars to add more jobs and then when I tried to enter a third job it ask me to pay again!!! So it charges you 3 dollars for each job you enter that is abusive!!! Works great for what I need which is to track my tips and hours. I was using pen and paper for a couple years before I realized there’s probably an app for that! 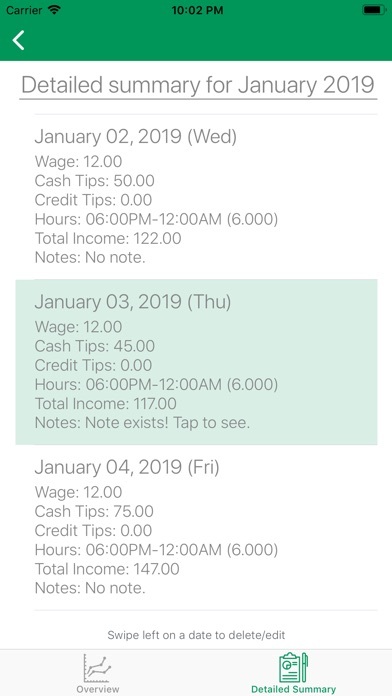 So far I really like this app because it’s streamlined and simple to use and provides different ways to view my tips and wages. I also like that I didn’t have to create an account but I’d be able to backup my data as necessary. I’ll probably pay to access more of the features but the free version provides a lot already. What I’d love to see is a calendar view like some of the other apps. I liked tracking on paper (I used a calendar style) because I could see the whole month at once and how I was trending on specific days or I’d be able to easily refer back to the same time last year to compare how much I was making. Great app overall. I plan to continue to use this one. Really loved the app until the latest update. The start/end time menu do not take into account any breaks that have occurred during the shift which can cause a miscalculation in total hourly wages. An option to input break time would remedy this. I appreciate that you tried to add a new feature to improve the user experience of your app. Thank you for taking the time to do that. In the new update there is no option to just put in the calculated hours and when I tried to put in my start and end times I kept getting an error message that they were formatted wrong. I tried civilian time using the am/pm buttons and military time. Neither worked. Once I was in the screen to input information I wasn’t able to back out of it. Please go back to the drawing board, you’re almost there! I’ve really enjoyed this app. Super easy to input my tips and any notes for the day. 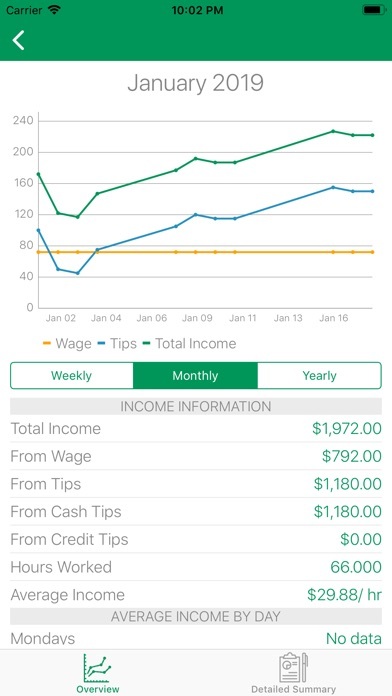 I am not a server but work as a caddie and have not found any other tip tracking app that works as well as this one for what I looking by to track. I would give this app 5 stars easily but there are a couple things that I think need to be tweaked. - When looking at the week, it allows to look back at the previous 7 days, not the an actual Sun-Sat. I think it would be extremely useful if under some sort of settings I could choose a custom beginning and end of the week. For instance, my pay periods are weird, Thur-Wed. - Sometimes I work multiple shifts in one day. At the moment, I’m unable to track those shifts individually since they are the same day. 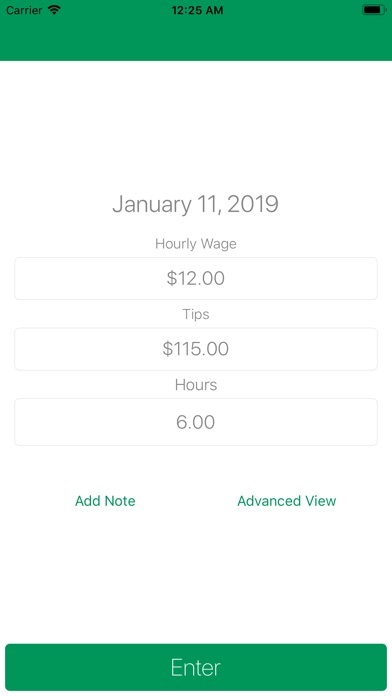 Would be nice to be able to separate those two shifts to track hours and tips individually on the same day. - Lastly, The app is not allowing me to add additional jobs. 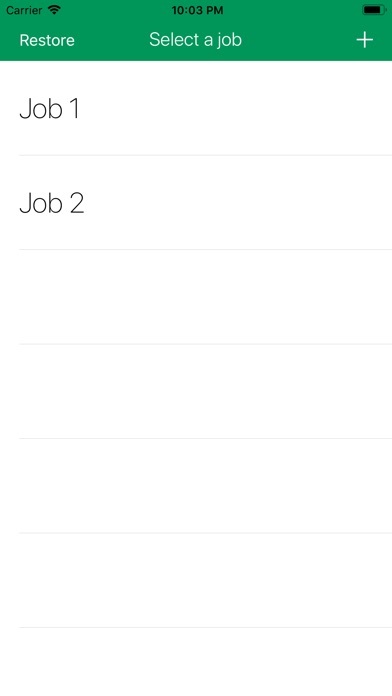 Currently, I can only track one job even though there is a way to add others jobs, for some reason it doesn’t work (the only bug/glitch). I work a couple of side jobs and would love to track them on the app as well.